For a classic element of medieval garb, you need look no further than at the tabard. It was worn by noble and serf alike, for countless reasons under the sun, and now, gentlemen, you can have a nice one of your own, in this Mens Medieval Tabard garment. 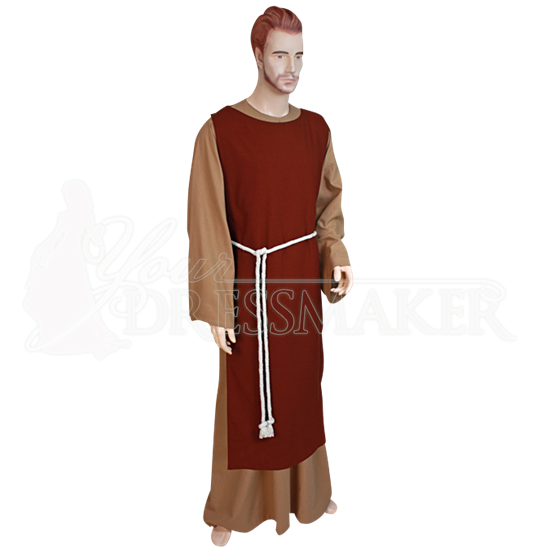 This classic and iconic garment was worn by virtually everyone in the middle ages, at one point or another, in various levels of detail. This particular garment is designed to rest comfortably on the shoulders and hang open along the sides, just like a traditional tabard. It also lacks sleeves, which makes it a great choice to wear in the summer, when heat might prove to be a concern. The garment is made entirely from 100% natural cotton and lined with satin to provide the most comfortable fit possible. It is also offered in a variety of colors, all but ensuring that there is a tabard in the right hue to suit your needs and your taste. Please be aware, though, that the tabard is pictured above with an underlying cloak and a rope belt, neither of which are included with the garment itself. Peasants and princes were known to wear tabards at times, as were warriors and knights, both on and off the field of battle. They are versatile and comfortable, and that makes this Mens Medieval Tabard a great choice for anyone to turn to when they want to build a classic and iconic medieval look.